Ah! It’s great to be a giant monster. You can do whatever you want, whenever you want. Who’s going to stop you? Well, that’s the rub. You’re not the only giant monster. Other monsters are running around smashing the stuff that’s yours to smash, eating the things that are yours to eat. It has to stop! It will stop—soon, you sense. An epic battle looms on the horizon between you and all the other monsters. When the time comes, will you be ready? 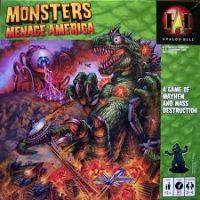 Add a Review for "Monsters Menace America"